We hope that you're enjoying the new launcher and platform, but some users have been a bit confused about how to install packs now. There's no big "Add A Pack" button in the launcher, and that's causing some confusion. Over the next couple days, we'll be improving the way the launcher directs you to install new packs, but in the meantime, here are the three ways that you can install a modpack on the Technic Launcher. The search bar on the left side of the launcher can be used to find the packs your heart desires. Just put a single term and the best packs of the platform that match will be brought to your launcher. Don't see what you want? Click the "Find more" link at the bottom to see more results, and use the second installation method. Are you already at the Platform page for the pack you want? With your launcher open, click "Install This Modpack". It will be added to your Launcher! It's magic. Just about anything can be put into the search bar, and the launcher will do its absolute best to turn that into an installed pack. Got a Platform API link? That'll work. Almost anything will work, and we hope you'll use this advice to try out lots of packs you haven't seen before. Have you seen Trending Modpacks? You can see it by selecting Browse Modpacks from the Discover menu at the top of the Platform, and it's a great way to discover cool packs you haven't heard of before. It changes all the time! So enjoy the new Platform and give the new launcher a spin. PLEASE GO BACK TO THE OLD LAUNCHER THE NEW ONES ARE SLOW AND TAKE FOREVER TO DOWNLOAD, THEY ARE NOT AN IMPROVEMENT AT ALL, THEY'RE JUST A PAIN. There's a pretty big edit button on the right side of the page, and browse is under Discover at the top of the page. I linked to it in the article you are responding to. You can add pack art under the "resources" tab. there should be a browse feature within the launcher ^^. Could you go into further detail about the problems you're encountering? the old one was way easier to navigate your way through. It would be nice if it actually worked. I've been trying for half an hour to download a pack and none of the options are working. The search can't find anything, the Install This Modpack button does nothing on the website, every time I type in the API in search it tells me it's broken. I liked the old copy and paste method better it worked and I didn't have to jump through hoops to get a new mod pack. Thats actually really helpful thanks, but would it be possible to add a way to minimise the launcher when its loading up or downloading updates because its quite annoying trying to do other things while the technic symbol is right in the middle of the screen. One thing I've noticed about the comment feature on these news posts is that the oldest comments, not the newest, are the ones that show up at the top. This is confusing a lot of users, and is resulting in said users posting a message multiple times in comment-heavy articles because they think their message is not getting through. When i write something in the search bar, on the launcher, nothing happens, it just says "Find out more on the technic platform"...so i put the URL in and it says, "Broken API link"...meaning i cannot search any more Mods....What do I...I have restarted the computer, download more copies....i dont know what to do now? Help me please!! somehow with this update you've managed to break my game again, thank you for making me waste countless hours over and over again. Can't help with no information. You can up the memory in "launcher options" -> "java settings"
Sorry, you must use the new launcher. Are you sure you are using your MOJANG username and password? All works for me... I dont know about you. It's so much easier now, thank god! the search bar and all else failed.what i do? I entered the URL in the launcher and nothing happened... is there anything i can do about that? if anyone gets the api link broken message, delete all installs of java through control panel and download this one http://www.oracle.com/technetwork/java/javase/downloads/jre8-downloads-2133155.html fixed it for me. don't even have to get the link from the website, the search box works. if i launch it opens a different minecraft (instead of the one i purchased on minecraft) with a one that i dont know) and what do i do next do i need forge!! Also how do you run the mod? I'm not sure if I understand this, but I'll try to help you. Do you mean that it opens a launcher other than the one that Mojang gave you when you bought Minecraft? That is normal, this is a different launcher. No, you do not need to install forge, installing a modpack will also install forge. 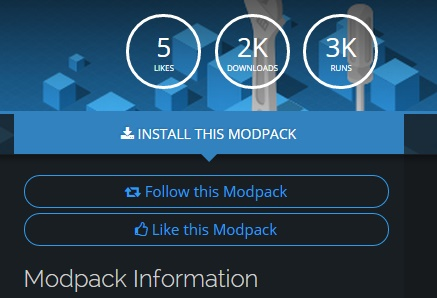 Once you install a mod on the technic launcher navigate to the modpacks tab in the launcher, select the modpack you installed, and click "Install". It will then download everything included in the modpack. 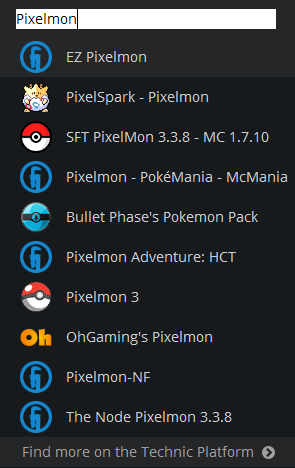 Note: if you already have installed a modpack the "Install" button will change to a "Play" button.